How to Visualize Model Dependencies with Analysis Diagram? Current: How to Visualize Model Dependencies with Analysis Diagram? Discover consequence of changes before modification by analysis diagram. 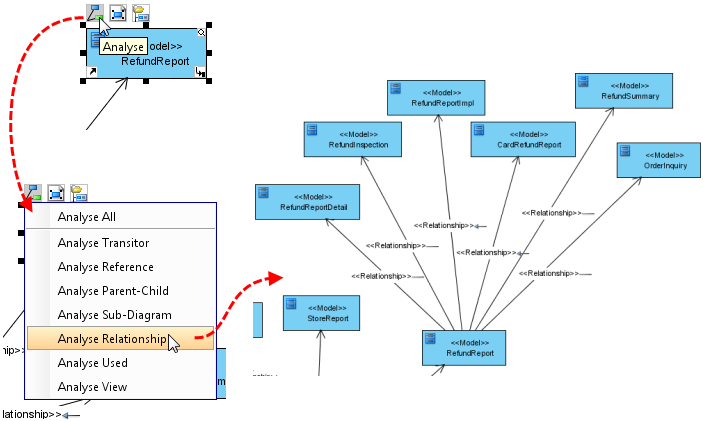 The "Software impact analysis with analysis diagram" shows how to perform use analysis diagram to discover and visualize all related elements, relationships and views of UML class. Open the diagram Sales Order. Let's analyze the Report class. Right click on Report class and select Related Elements > Analysis. The Analysis winodw is shown. Let's create a new analysis diagram with default name. 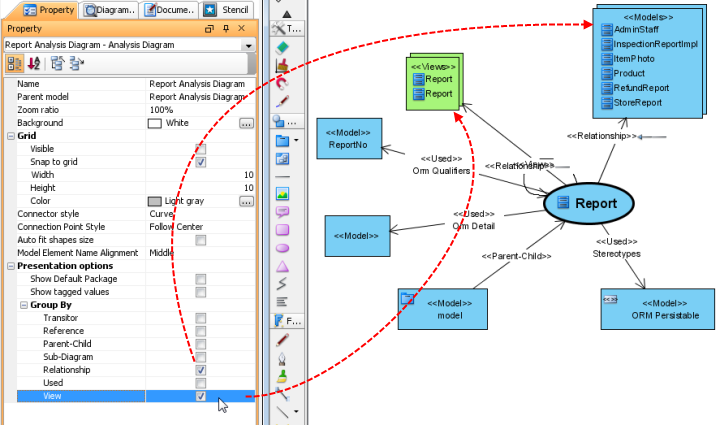 You can specify what information will be included in the analysis diagram, including Transitor, Reference, Parent-child relationship, Sub-diagram, Relationship, <<Used>> dependency, and the View of the model. Transitor: Transit from and to of the selected model. Reference: Reference item of the selected model. Parent-child: Parent and child relationship involved by the selected model. Sub-diagram: Sub-diagrams under the selected model. Relationship: Other elements related to the selected model. Used: Used dependency involved by the selected model. View: Diagrams which contain the selected model. With Composited model properties checked, the resulting diagram will be very big. To keep things simple, let's uncheck it. 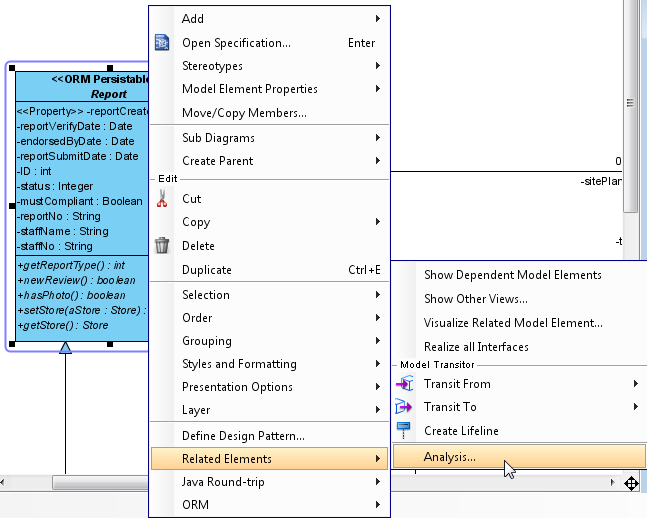 Keep the other options selected and click OK to create an analysis diagram. Here is the analysis diagram generated. 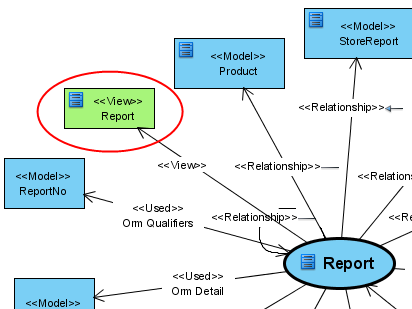 The View represents the diagram containing the Report class. You can right click on the View shape and select Open View, or using the Open View resource icon to open the diagram. The Model shape represents the element which is related to Report class. 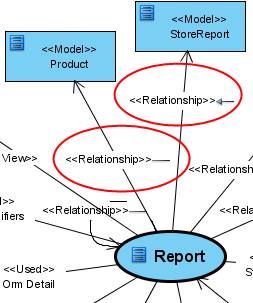 For example, the Product class is related Report with association, and StoreReport class is related to Report with generalization. You can always right click on the shape and select Select in tree, or using the Select in Tree resource icon to locate the element in Model Explorer. 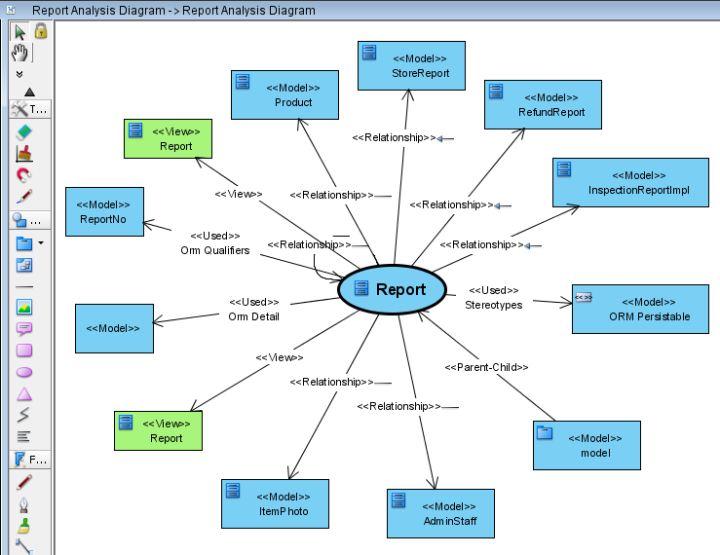 The items in the analysis diagram can be grouped together through the Group By option in Property pane. Let's group the Relationship and View in the diagram. You can further analyse the elements by clicking the Analyse resource icon, and then select the criteria you would like to analyse.